Everyone likes beautiful desktop wallpaper, but who wants to spend time searching for them? Save yourself the trouble and get a new, high-quality wallpaper image on your Chromebook’s desktop every day. Google’s own Art Project offers high-quality art, or you could get Bing’s image of the day as your wallpaper. These apps are simple to use. Just head to the Chrome Web Store and install the one you want. 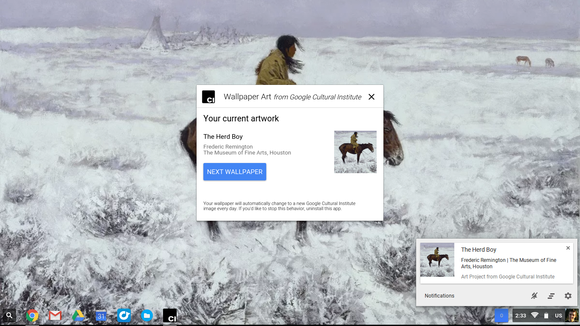 Google’s own Google Wallpaper Art app will place images of art from the Google Art Project on your background. This is part of the Google Cultural Institute, which is digitizing paintings and other images from art galleries and collections for public viewing. If you’re interested in an image, open the app on your Chromebook or just check your notifications for more information. You could just browse the entire Google Cultural Institute’s Art Project archives online, too. The Google Wallpaper Art app. Microsoft’s Bing homepage updates with a new, beautiful image every day—but who wants to use Bing? (Okay, some people do.) Skip the Bing part and install the Bing Wallpaper for Chromebook app from the Web Store. Those new wallpaper images will be automatically delivered to your Chromebook’s desktop every day. Microsoft puts real effort into these images, and it shows. Windows users can get automatically updated daily wallpapers with Microsoft’s Bing Desktop application. 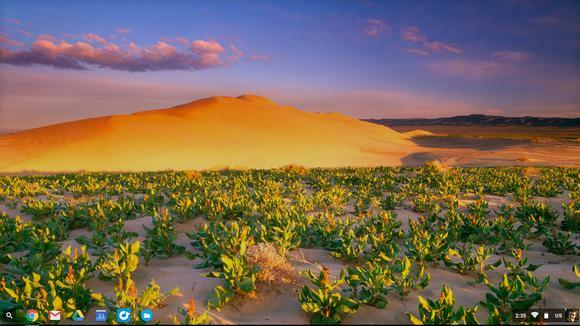 The Bing Wallpaper for Chromebook app. 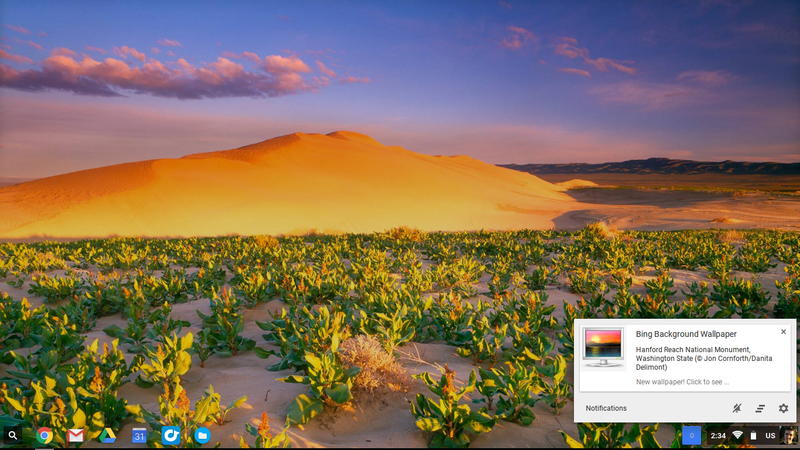 These apps take advantage of the chrome.wallpaper API, which was added back in Chrome OS 33. They only work on Chrome OS, so you can’t use them on a Windows, Mac, or Linux PC. Thanks to Chrome OS’s security model, you don’t even have to worry about using these like you’d worry about using a freeware wallpaper-changer on Windows. You can see that the only permission these apps have is the ability to change your wallpaper when you install them. Other Chrome users aren’t left out entirely. Google does offer Chrome extensions that will change your new tab page to show images from the Google Art Project or satellite photos from Google Earth. These will work on Windows, Mac, and Linux, too.